Times Observer photo by Brian Hagberg Warren’s Andrew Davidson puts up a three-point shot during the second quarter of a game against Bradford at Warren Area High School, Monday, Dec. 18, 2017. Davidson had 18 points to lead the Dragons to a 62-45 win. Warren’s boys basketball team took full advantage of a final tune-up game before region play begins Friday. 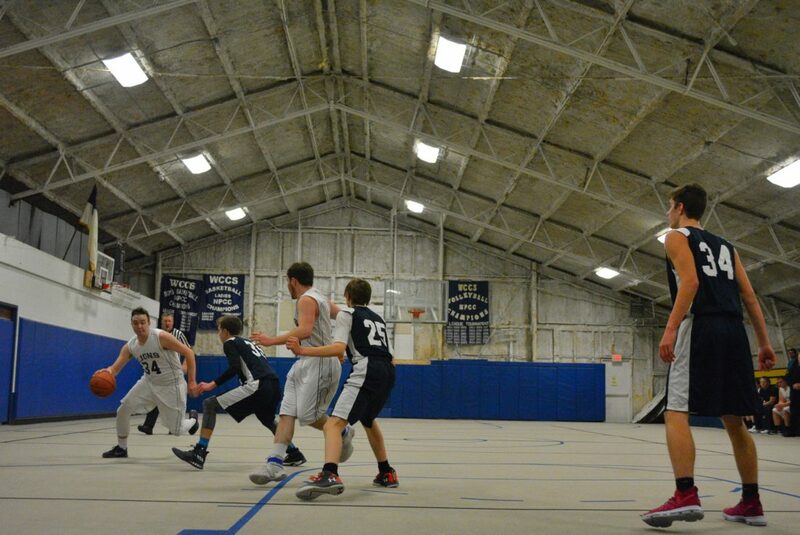 The Dragons opened the game with a 9-0 run and never trailed as they defeated visiting Bradford, 62-45, Monday. It wasn’t all smooth sailing for the Dragons as they allowed the Owls to get back in the game late in the first quarter. A pair of turnovers led to four quick Bradford points. Steven Knowlton then drained a three late to cut it to a 13-9 Dragon lead after the first. “We had offensive and defensive mistakes,” Berdine said. Times Observer photo by Brian Hagberg Warren’s Devin McMeans puts up a jump shot in front of the Flannel Panel during a game against Bradford at Warren Area High School, Monday, Dec. 18, 2017. The Dragons defeated the Owls 62-45. Andrew Davidson got Warren out of a scoring lull in the second quarter, connecting on three three-pointers and scoring 11 of his game-high 18 points in the frame. “He’s normally looking for his shot,” Berdine said. The Dragons found themselves in foul trouble midway through the second quarter, but got some big minutes from Davidson, Devin McMeans and Maxx Davis. Warren led 32-24 at the half. Davidson hit two more field goals, including another three, to help the Dragons pull away in the third quarter. “I told the guys they need to use the first three minutes of the third quarter to reestablish what they were doing in the second,” Berdine said. Photo submitted to the Times Observer Warren County Christian School’s Jared Younger (34) dribbles by a Christian Life Academy defender during their game at Warren County Christian School, Monday, Dec. 18, 2017. CLA defeated WCCS 56-38. The early part of the fourth quarter became the Caleb Ei show. He had a fantastic under-the-basket reverse put back, then followed with a breakaway layup to put the Dragons up 51-36. 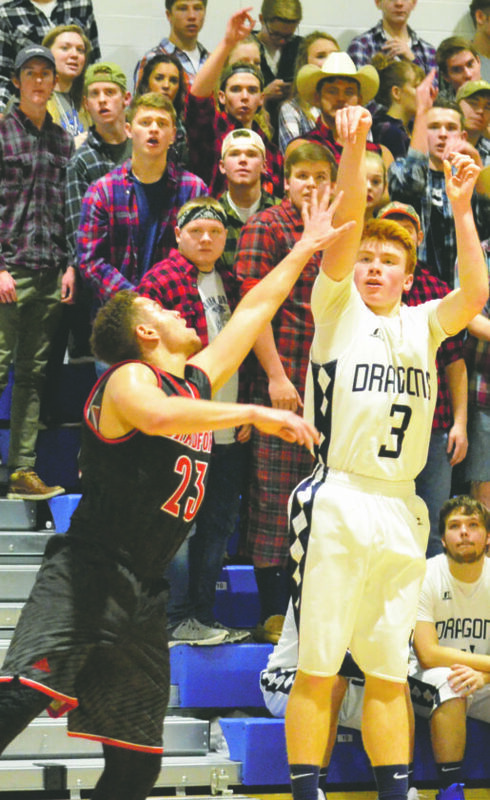 Bradford was able to get some points in the paint, but it wasn’t enough to keep pace with the high-powered Dragon offense. 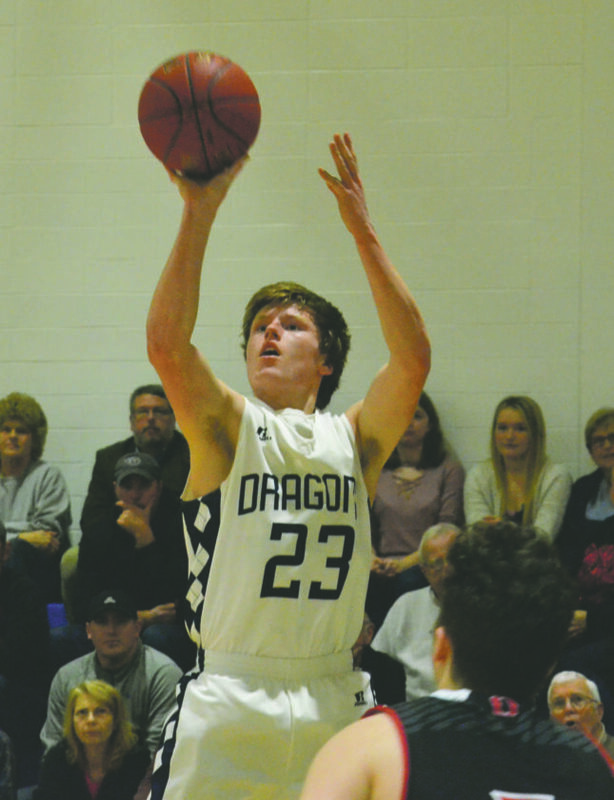 Davidson led a trio of Dragons in double figures. Ei and Griffin Suppa each had 11 points. All three also each had four rebounds. Aidan Morrison had six points and 10 rebounds. Steven Knowlton paced the Owls with 14 points. Warren hosts Conneaut Friday to open region play. “This is the biggest game of the month,” Berdine said. Warren jumped out to a 21-12 lead in the first quarter and never trailed as the junior varsity team defeated Bradford, 57-40. Tyler Gustafson had 14 points to lead the Dragons, while Ryan Rafalski had nine and Nick Hussey added eight in the win. Christian Life Academy jumped out to a 19-7 first quarter lead on its way to a 56-38 win at Warren County Christian School Monday. CLA outscored WCCS in the second, third and fourth quarters by 1, 2 and 1 point, respectively. Jones said Ryan Widener did a nice job in the post against much larger opponents. “He did a nice job being asssertive on offense,” Jones said. Christian Life Academy won the junior varisty game, 32-12. RIDGWAY- Youngsville ran into a buzzsaw in the form of District 9 power Ridgway on Monday, falling 56-17. Ridgway outscored the Eagles 28-9 in the first half to take control of the game. The Elker defense was stout, holding the Eagles to eight field goals and only two foul shot attempts. Dasan McAvoy led Youngsville with 6 points, all in the first half. Freshman Timber Bower added four points. 12 Eagles saw action in the game. Hendrickson 1 0-0 2, Mack 0 0-0 0, McAvoy 3 0-0 6, Bower 2 0-0 4, Proctor 0 0-0 0, Peterson 0 0-0 0, Myers 1 0-0 2, Ecelberger 1 0-0 2, Mercado 0 1-2 1, Dell 0 0-0 0, Olewine 0 0-0 0, Wilson 0 0-0 0. 3-Pointers: Y- None. R- Thorwat 1, Mitchell 1, Allegretto 1, Reynolds 1, Dush 1, Zamiesoki 1.